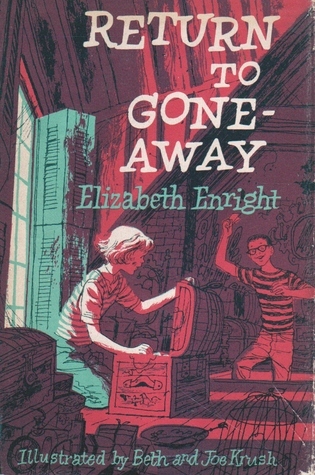 Return to Gone-Away is Elizabeth Enright’s sequel to her 1958 Newbery Honor Book, Gone-Away Lake. The second book follows the adventures of Portia and her family as they work to restore an abandoned house at Gone-Away Lake so they can spend the summers there. As they uncover the treasures and skeletons hidden in the closets of their new home, Portia and Foster spend time with their cousin Julian and their elderly friends, Uncle Pindar and Aunt Minnehaha, who indulge the children’s interest in history, as well as their imaginations. Though this sequel is nearly as well-written as the first book, I didn’t see much of anything new in this story that made me understand why a sequel was necessary. Though I could see readers being interested in the mysteries of an abandoned house, Portia and the other characters already had the experience of exploring Gone-Away in the first book, and this story just seemed like more of the same. I kept waiting for whatever the new twist was going to be, but it never quite happened. I also had trouble buying into the idea that kids are overly interested in learning about what older people were like as children. I think readers like the kind of stories Uncle Pindar tells about his boyhood, but the structure of this book distances the readers from those adventures by telling about them in the voice of an adult. I think this would be a much better children’s book if it stuck more to the children’s point of view. It might have been interesting to either have Pin and Minnie tell their own stories in their own book where they appear as children, or to have the book alternate back and forth between the present and the past. Everything that happens in the story is interesting, but sometimes the interesting stuff is obscured by the way it is delivered. I also think Pindar and Minnehaha are kind of creepy. I think we’re supposed to see their love for the past as charming, but to me, it just looked sad. I continued to think of Miss Havisham, who is the fictional picture of emotionally instability, and certainly not someone I’d let kids hang out with unsupervised! All in all, unless Gone-Away Lake is your favorite book of all time, there’s no real reason to also read the sequel. Nostalgic adults might find it charming, but I was pretty bored, and I think most kids I know would choose to put this book aside in favor of something with a bit more action, or at least a bit more of a kid-friendly approach to storytelling.